- Found throughout the body, covers all body surfaces both inside and out. categorized based on the ______________________ of the cells and the ___________________ of cells. B. SIMPLE CUBOIDAL - single layer, cube-shaped cells. Where have we seen these cells? According to the Fitpatrick scale, how many skin types are there? _____ What type are you? 1. What are the three main layers of skin? 2. What are the two main cells found in the epidermis? 4. How does melanin protect cells? 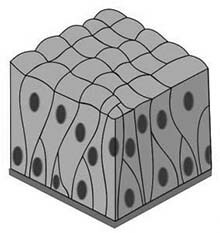 E. PSEUDOSTRATIFIED COLUMNAR - appear "stratified" but really a single layer with nuclei at various levels giving the appearance of layers. *What happens if the cilia of cells do not work properly? C. FIBROUS C.T. - dense tissue, closely packed, thick collagenous fibers and fine network of elastic fibers. Few cells, poor blood supply, thus slow healing. 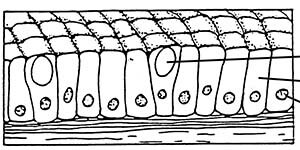 E. BONE TISSUE - _____________________________ tissue. Rigid due to mineral salts.